Much better fishing than last week, with great sea conditions and excellent weather, fishing, species biting are Bonita, Rooster, Needle Fish, Skip Jack Spanish Mackerel, Wahoo and Trigger Fish. With nice sunny days all week, an average temperature of 79 F, and an average water temperature of 76 F.
With 24 fishing trips provided by Sushi Time Sport Fishing, we had a 90.90% effectiveness catching fish. Our fleet production this week is 36+ bonitas, Rooster, Needle Fish, skip jacks and Spanish Mackerel, 14+ Dorado in the +30 lbs. category, 4 Stripped Marlin, and 7 yellow fin tuna. Our fish mostly caught this week on live bait. The highlight of this week was the trigger fish which are always super fun to catch. The Hot spot for this week was on the Pacific side from Pedregal to the Old Lighthouse. 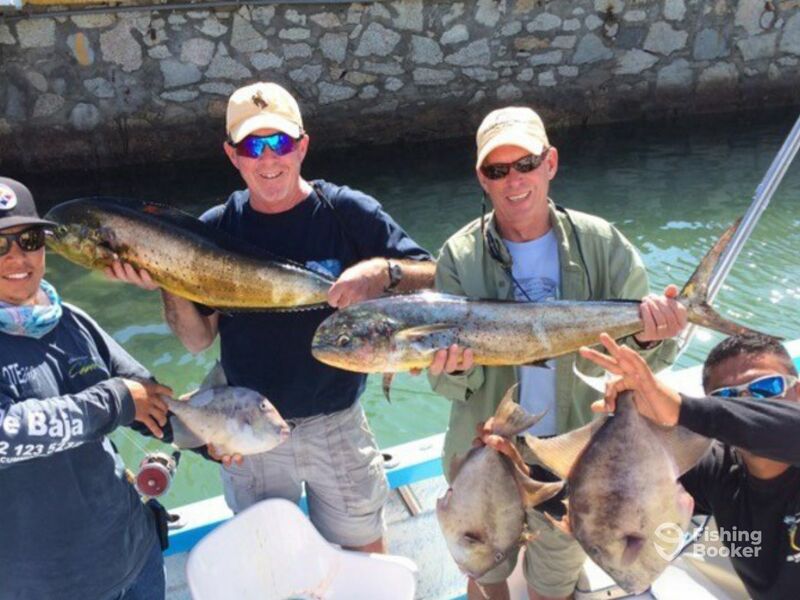 Sushi Time has over 15 years of experience fishing the abundant waters of Cabo San Lucas targeting Mahi Mahi, Marlin, Sailfish, Roosterfish, Snapper, Yellowfin Tuna and many others species found year round. The Sushi Time crew are bilingual, and eager to help guests catch as many fish as possible!